Mozilla Firefox is a very popular browser that has been constantly improved over time and offers an overwhelming number of features and advantages. - Blocks pop-up windows efficiently and keeps unwanted advertising away from your desktop. - Tabbed browsing allows you to open multiple pages in a single window and load links in the background while remaining on the current page you’re viewing. - Built-in Google search engine. - "Find As You Type" function helps you find page text and links by simply typing. - Effective protection of your privacy with simplified privacy controls. - The streamlined browser window offers flexibility and configurability, expanding the viewing area of the page more than any other browser. - Offers multiple options to personalize your browser with a great number of free extensions and themes, all downloadable at a glance of a mouse click. 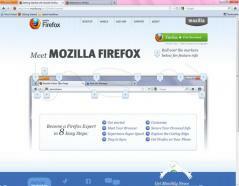 The latest Mozilla Firefox has significantly improved speed compared to any prior version. It’s easy to notice that start-up, graphics rendering and page loading are performed a lot faster in the latest Firefox along with many other performance improvements. Set your own security level for your Firefox browsing experience. Now you can fully customize each security option like settings for passwords, cookies, loading images, installing add-ons or even create exceptions – sites that don’t need the third degree. Stop unwanted browsing access, downloads and more by enforcing parental control settings you’ve entered on Windows 7. Firefox performs an automatic search for a secure connection before installing or updating any add-on, third-party software and Personas. The Add-ons Manager allows the user to install and discover add-ons while remaining on Firefox. Evaluate and choose your add-ons by browsing ratings, descriptions, pictures and recommendations. The Add-ons Manager offers an organized list of all your add-ons or third-party plug-ins which you can view, manage or disable in no time. Auto-update feature will be activated every time you open the Manager panel. The Firefox interface is very flexible and can be customized according to your personal preferences. You get to choose where different elements get to be, organize them, add or remove buttons and fields and finally end up with your own unique browser. To get started right-click on the navigation toolbar and select “Customize”. Very smooth scrolling that Chrome lacks. Pocket integration is useful for me. Tried Hello - pretty decent. Wide array of customization options. One of the browsers I use. This update made Firefox even faster and smoother. All the quick links are now in a drop down, instead of being quick. Switched Open in New Page and Open in Tabs, so I keep opening a new page. Not compatible with online forms. Uses too much memory, skips, shutters and drags. NOT FASTER AT ALL. Trying to find 3.6 to download and return to. Deleted 4.0, and am now stuck with IE until I can find a back up version of the old FF I loved. Will NOT do 4.0. Firefox is still tbe world's no 1 browser in my opinion. It's fast, secure and full of useful plugins. I tried Chrome and other browsers but in the end I still come back to Firefox! Enjoy it ! Mozilla Firefox 4 is the best browser.